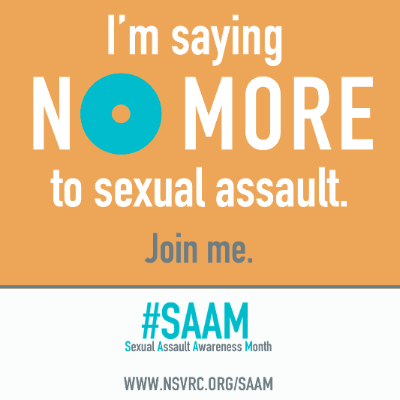 I will be making this post everyday for the rest of the month as April is No more to sexual assault month. Please feel free to reblog, retweet, FB or all three. Categories: Sexual Assault | Tags: abuse, children and domestic violence, depression, domestic abuse, domestic violence center, domestic violence education, Intimate partner violence, sexual abuse, sexual assault, violence | Permalink. If you want to. I always value your opinion and this one seems a little slack to me, but I know you’ll lay it out there. Reblogged this on My Eclectic Existence. I LOVE the No MOre campaign! Unfortunately for where I live, there is little awareness of domestic violence and sexual abuse…until it is almost too late for most victims to escape safely…my new mission…to educate anyone who crosses my path…to plant seeds of knowledge. Someone did this for me once…didn’t really educate me, but told me about the domestic violence center when they started seeing the red flags that I was ignoring! That is a shame. Our DV center is located in a place you really have to hunt down to find. The local police are well nothing to speak of, but we don’t have PSA’s or any such things for this county and my county has the highest crime rate in the state concerning DV. Our DV center did offer classes, which I went to but they barely touched the surface. But enough to remind me of the red flags I ignored as well. We can make a difference even here. I know we can. My county is also home of the highest DV rate in the state. Oddly enough, it also has the greatest percentage of a particular religious flavor…This was concerning to me……I hope there is not a cause-effect relationship going on, but the correlation is disturbing. I also believe we can make a difference! By encouraging one another, we are building a mighty force…. My once silenced voice is now strong and bold…..collectively…watch out! We should all stand against type of assault but especially sexual abuse. There is no way you can excuse it. Thank you so much. I’m at your place now. I enjoyed your article very much. Thanks for the reblog. Your welcome and I’m being polite lol I couldn’t say what I really think about any abusers on here. LOL…..I’ve not been very polite in a lot of my posts. We should all agree with this.